Did you forget your login? Do you need to check on the status of your draft? Browse the options below for help with account questions and issues. ​How do I log in? Your user name the first part of your email address, up to the "@" symbol. 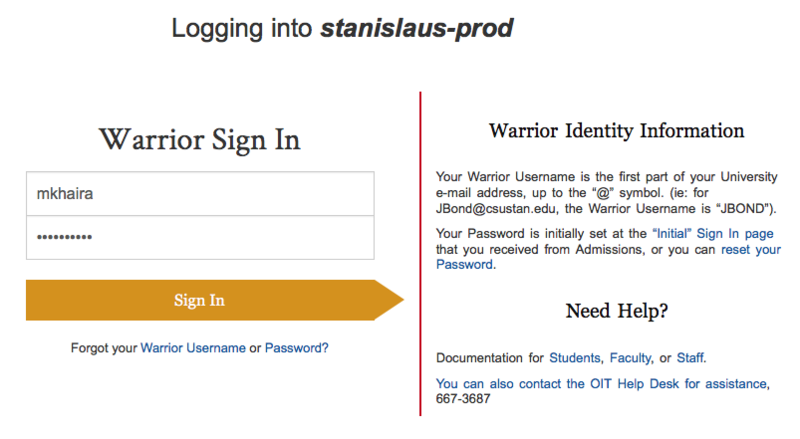 (For example, if you are Jane Done: jdoecsustan.edu | login = jdoe). Your password is the same one you use to logon to your computer, or check your Outlook mail. How can I start editing my pages? If you haven't logged in yet, follow the steps above. From your user page (accessed by clicking "Hello [your username]" near the top-right of your window), select the department you'd like to edit. Navigate using the normal menus or A-Z directory to find the page you need to change. When you are on the page you'd like to edit, click "New Draft". This will open a Microsoft-Word-like editing window. You may change your content directly within the edit window. If there is already a pending draft of the page, "New Draft" will be replaced by "View Draft" and "Edit Draft". View will let you look at the changes made thus far, edit will allow you to continue working on the page. I'm ready to submit my changes, or I'd like to save them for later. After you've completed your changes, scroll to the very bottom of the page (when in edit mode) and look for "Revision Information". Click the "Revision Information" tab. You will see a drop-down menu which says "Draft" by default. Leaving it as "Draft" and clicking the "Save" button at the bottom of the page will save your work. If you're ready to have your page reviewed for publishing, change "Draft" to "Needs Review", and then save your changes. Once your "Needs Review" edits are saved, someone from the web team will review your content and publish it to the web. You're all done! I'm not sure if my draft has been published. How can I check? Click the "My Drafts" button near the top-left of your browser, in the black ribbon bar. If you still have pending drafts, they will show up here. From this window, you can click the title to continue working, or change the moderation state to "Needs Review" if you are ready for publishing. Navigate as normal to the page you wish to check. When you are at that page, look to see if you can see "New Draft". If the editing links say "Edit Draft", your draft has not yet been published. If you have done all of these things, and you're still unsure, email webupdate@csustan.edu. One of the website administrators will assist you personally!